The brand new trailer for Avengers: Infinity War is here. Without exaggeration, this is going to be the biggest movie that Marvel Studios has ever released. It will also be the the longest Marvel Cinematic Universe movie as well. This is something that has been in the works for a very long time and all of the pieces are finally coming together in just a couple of months. Thanos is coming and he wants the Infinity Stones. Now, we get a much better look at how that's all going to go down in this new Infinity War trailer. 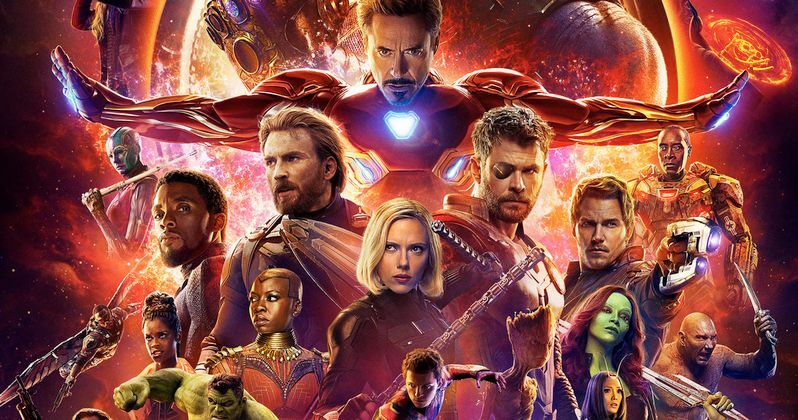 Avengers: Infinity War isn't like any MCU movie that's come before and Marvel is treating it as such. They made fans wait months after the first footage for the movie debuted at D23 and San Diego Comic-Con before finally releasing the teaser trailer online last November. At that point, all was forgiven, as the footage blew fans away and is now the most-watched trailer ever in YouTube history. Safe to say, this new Avengers: Infinity War trailer could take over the top spot, as the hype is really starting to build just a couple of months out. But this could be some of the last new footage we get before the movie arrives on May 4. Kevin Feige and Co. seem to want the surprises to remain surprises. This movie serves as the culmination of an unprecedented cinematic experiment ten years in the making. From the first time we saw Thanos during the post-credits scene in The Avengers, everything has been building to what is being billed as the "ultimate, deadliest showdown of all time." There's a lot of pressure on Avengers 3 to deliver the goods at this point. Can directors Joe Russo and Anthony Russo really pull this off and meet everyone's very wild expectations? Marvel fans all over the world are certainly hoping so. Iron Man, Thor, Doctor Strange, the Hulk and the rest of Earth's mightiest heroes, with the help of the Guardians of the Galaxy, unite to battle their most powerful enemy yet, the Mad Titan himself, Thanos. He's also bringing his Black Order along with him, so The Avengers are going to have that to contend with as well. Thanos is on a mission to collect all six Infinity Stones so that he can "balance the universe." Which, by the looks of things, means killing a whole lot of people all across the stars. The fate of the planet rests in the hands of the heroes we've come to know and love over the years. This movie is also largely going to be setting us up for what's to come in Avengers 4, which arrives next year on May 3 and will be the final Phase 3 MCU movie. The pressure was always on for Avengers: Infinity War, but given the success that Marvel has enjoyed with Black Panther, there's going to be even more of an expectation to deliver the goods. Luckily, T'Challa and Wakanda look to play a huge part in this movie, which bodes quite well for those around the world who enjoyed Black Panther.